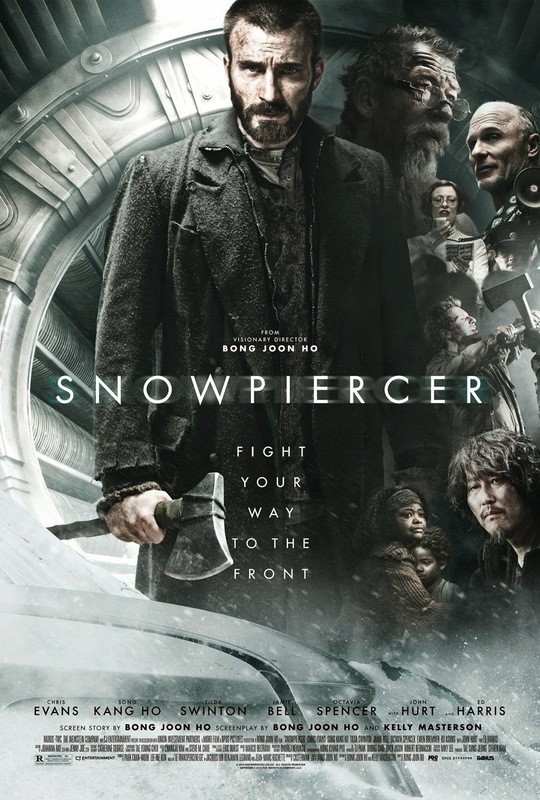 What Snowpiercer has to its advantage more than most standard action or post-apocalyptic films these days are its interesting ideas. From the opening moments of the film where the audience is exposed to a flurry of exposition placing us in a world where man has attempted to control nature and in return has damned our earth to a frozen eternity I was hooked. The only survivors being locked within a speeding train, built and engineered to last forever, traveling the same course over and over again, completing the circle around the globe once a year. We learn of the passengers at the back of the train, those who are treated on a sub-human level and the few within the beaten and battered group that are planning a resistance, a revolution. This may instinctively conjure up comparisons to Elysium wherein the rich and poor are so distinctively separated that it seems convenient for the film to be interpreted as some type of propaganda, but director Joon-ho Bong never allows his film to slip into this kind of piece. Instead the throughline of Snowpiercer remains an unrelenting and unforgiving journey from one end of this locomotive to the other wherein our protagonist Curtis (Chris Evans) not only discovers the layers and the societal structures of those who live ahead of him, but how easily they have forgotten what is taking place not three cars away. Where many a post-apocalyptic film will maintain the focus on how society has come to work in the wake of failing and in turn sacrificing character development both this and The Rover prove that it is the actions and mentalities of the characters you create that define the rules of the world and not the mounds of exposition you have them spurting so that we understand those rules. 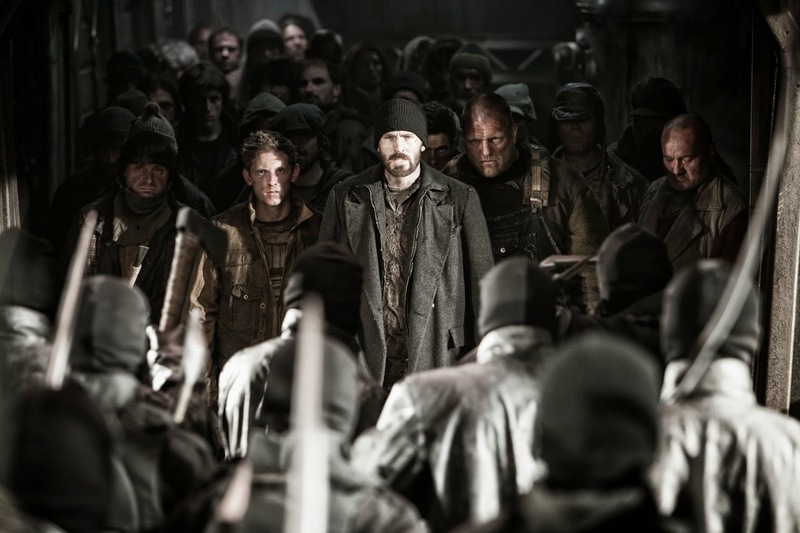 Snowpiercer wastes little time explaining things, it trusts its audience and it gives only a brief amount of set-up before diving into the narrative that Curtis, his second in command Edgar (Jamie Bell) and their wise old leader, Gilliam (John Hurt), are setting in motion to push forward. What follows is a layered and engrossing series of obstacles that avoids feeling like a video game by creating these characters and dynamics between them to where we can't help but become invested. Curtis (Chris Evans) and Edgar (Jamie Bell) are ready to lead the charge against those more fortunate. Curtis is an angry, determined man who has sat begrudged by those who exist in front of him and irritated by the class system that has been established on the train. It is through his affinity for Gilliam that he listens to his words and his suggestions and that he takes note when it seems the time has finally come for an uprising. Curtis is the natural born leader, but he is afraid to take on the role, still looking to Gilliam to fill those shoes despite the fact his time is clearly more limited. As for Edgar, it is clear the admiration he holds for Curtis and the resentment that Curtis feels for being held in such esteem. It's not that it isn't flattering, but Curtis feels a certain pressure from it and he doesn't know if he can live up to the hope that has been instilled in his own mind much less those around him. Bong makes it clear that Curtis' world has always been very bleak and dark with no room to breathe and so when it is time for him to kick his plan into action we understand there is no looking back for this man and Evans is able to pull off the humanity of both this pressure and this liberation with a gravitas that isn't necessarily dignifying, but certainly significant in the repercussions it blows open. We are introduced early to Senator Mason (Tilda Swinton) who comes from the front of the train and who, like a President Snow figure, blurts out speeches about pre-ordained positions in life. That she has somehow been blessed with deserving to be a hat and therefore is at the head of the train while those in the back are the shoes in life, those who belong at the foot. It is all very theatrical which Swinton plays to the hilt and it all gives the impression of forcing a balanced lifestyle so that order is preserved. "Know your place. Keep your place." Mason says with believed justification. Curtis, Edgar and their fellow residents of the tail aren't willing to settle for last place though and so the revolution begins with comrades such as Tanya (Octavia Spencer) and Andrew (Ewen Bremner) leading the charge along with Curtis to find their sons that have been taken from them with no explanation. There is no clear plan after the initial escape for Curtis and we wonder what pushes him beyond that of hope, but it seems best to believe his attempt to break the barriers around him before he reaches a breaking point within his own is the better, less selfish option. As I said in my review of The Rover last week: all systems fail eventually, it is inevitable, but usually when something is perceived as failing it is because something better, more efficient has come along-it will have been superseded. And like I said in that review this unfortunately is not typically the case when it comes to the loss of civilizing influences on humanity's way of life. These ideas can all equally be applied to Snowpiercer, but for as much as the world had fallen around these people they were immediately whisked into a new structure that told them who they were and where they belonged rather than allowing them to be lost and thus never giving them the chance to find themselves again and start anew. We could discuss the implications of Bong's film and how the script from he and Kelly Masterson (Before the Devil Knows Your Dead) and based on a French graphic novel is a metaphor for the oppressed and the oppressor or a mirror for how western civilization would rather stay safe in their comfy middle class than face the fact the less fortunate starve every day, but those are the obvious links you can draw and so what is almost more engaging about this adventure film is how well it layers itself and the visual presence that Bong and cinematographer Kyung-pyo Hong bring to this world. The gray color palette of the poor passengers and their dwellings with the transitional aesthetic that opens the train up as we move from car to car is both jarring in terms of the stark differences in how people are treated while also creating a contrast between the characters and their surroundings that is a piercing image that cuts straight to the point. Everything about this world feels so well-thought out not only in the way the narrative plays out, but in the facets of how life takes place. The punishments, the way in which food is dispersed and especially the dialogue all feel very pertinent to the central location. There is such a plausibility to the way things work and when the film makes its turns the logic with which life has come to exist continues to feel authentic because the dynamics of everyday life have not simply been glossed over, but highlighted in a way that we believe in these surroundings and the unknown threat that lies around every corner. 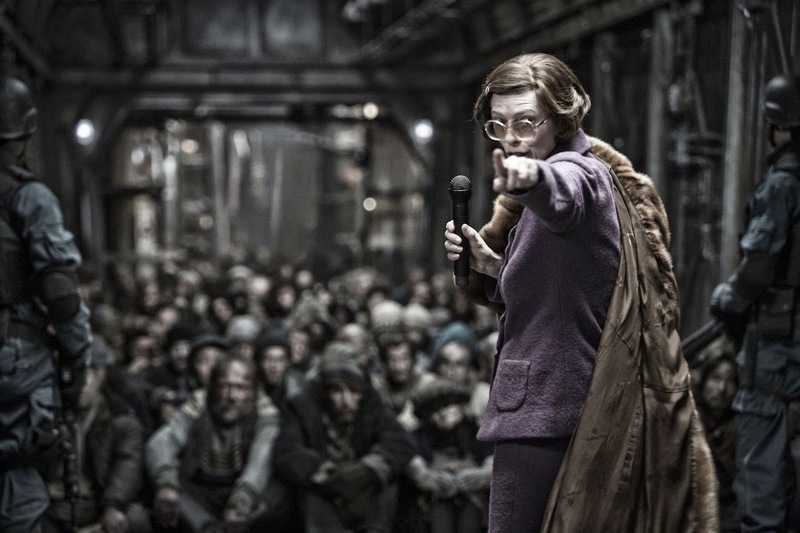 Mason (Tilda Swinton) delivers a speech to the unfortunate bunch on the Snowpiercer. What I really enjoyed about the film though and what sets it apart from not being overly pretentious yet still thoughtful is the way the action is orchestrated. Much of this credit will be due to Bong and his stuntmen and choreographers who have both designed brutal and ruthless fight sequences while focusing in on the specific moments and characters to pull the right amount of emotion and shock from the scene. There is quite a lot to be taken aback by in Snowpiercer as it shifts from peeling back the layers of existence on the train to savage violence that makes you both squirm while appreciating the honesty that the movie is portraying. This honesty comes in the form of sacrifice and there was no way Curtis was going to travel the full extent of the train without sacrificing many things, namely lives. It would be pointless to go into which members of the cast make it further, but just know that no one is safe no matter how well-known they are. As for the actors and their performances Evans is at the top of his game. The stoic, square-jawed earnestness that does so much for him in the Captain America films is allowed an undercurrent of pure hate here and it serves the volatile but intelligent Curtis well. We begin to wonder as the film draws closer to the front and of course its conclusion how much Curtis is actually willing to lose in return for what could end up being nothing. Paying to know what might happen with his life is worth it though I imagine having known earth outside of the train for seventeen years and then having dealt with being the scum of human existence for eighteen it was time to either go big or go home and Evans conveys this in a performance that is as physically able as it is emotionally resonant. Swinton is a scene-stealer every time she enters the frame while both Hurt and Spencer do what they do to bring a sense of sobriety to the proceedings. I've always liked Jamie Bell and he does fine here eliciting the necessary relationship between his Edgar and Curtis, but he seems a bit too old for the role in the way that I instinctively saw Edgar and Curtis as equals rather than as master/apprentice. Curtis is also aided on his journey by Namgoong Minsu (Song Kang-ho), a prisoner who built the system that locks the doors separating one car from the next, and his daughter (Go Ah-sung) both of whom are addicted to a drug called Kronol. These two prove more and more critical with each passing car, and the performances, while mainly spoken in their native tounge are translated via the emotion in their voices, body language and the other characters reactions which only serves to further prove the efficiency with how Bong has not only captured the impressive action and scale contained in this limited space, but how he naturally conveys the themes of his work not through language, but through key visuals and specific actions. Snowpiercer feels like a wallop of a film, one that hits you but won't necessarily stay with you much like Edge of Tomorrow. It is a film that is as entertaining as it is thought-provoking and I won't have a problem watching it again, but for all intents and purposes it hasn't resonated with me as much as something more meditative like The Rover has. That isn't to say this is a bad film, I clearly enjoyed it and there is absolutely no harm in being an intellectual action film disguised as a summer sci-fi adventure. In fact, I could very easily grow accustomed to these kinds of films. Here's hoping.